Ça va mal!! Edme Jean Pigal, (Scènes de Société. No. 16. ), Lith. de Langlumé, chez Gihaut et Martinet. This Edme Jean Pigal lithograph with the caption, “It’s bad! !” shows a doctor who exudes superiority and importance with his erect pose and intense gaze. He takes the pulse of his suffering patient who deferentially gazes up as he awaits the prognosis. 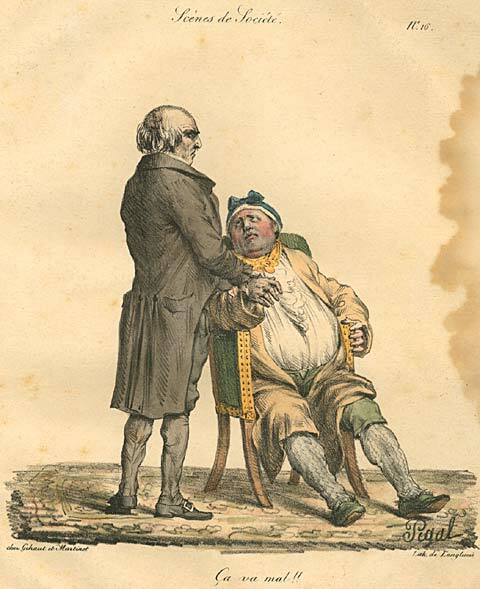 The patient’s attire, chair, and substantial abdomen indicate he is in the ranks of the prosperous. How the devil does it happen that all my patients succumb?… Yet I bleed them, I physic them, I drug them… I simply can’t understand! Mais docteur je cuis dans mon bain. (La Métempsycose réalisée. No. 2. ), á Bruxelles chez Daemll[? ], et á Paris, chez Méant, fils, rue St. Antoine, No. 9. 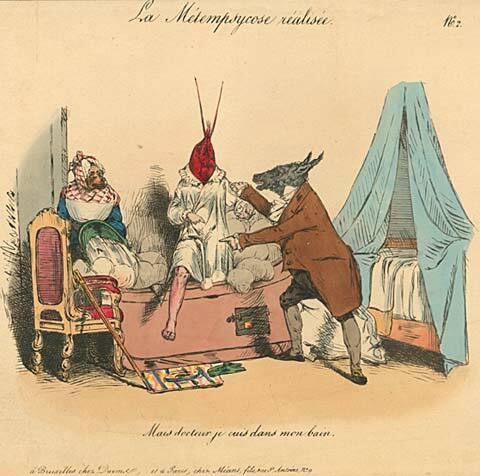 This print styled after Grandville, shows a patient not just turning as red as a lobster, but actually being transformed into a lobster, ready to be eaten by his persecutors. The central figure protests, “But Doctor, I cook in my bath.” The patient with his pinkish leg attempts to get out of the tub, but the wolf-headed physician has one hand firmly on his shoulder and the other sternly pointing to the water forcing the patient to stay in his bath. The dog-faced servant pours additional water into the tub that has at its base a small window showing a built-in compartment for fire to heat the water. Billowing clouds of steam illustrate the fire’s effectiveness. It appears that the therapy might just be worse than the ailment, not an uncommon occurrence given the state of medical treatment at the time. En gouterai je? L. Noël, Lithog: de F. Noël, Publié par Giraldon – Bovinet et Compie, Mds d’estampes, Commissionnaires, rue Pavée St. André, No. 5. The caption, “Will I like it?” is not required to understand this print. 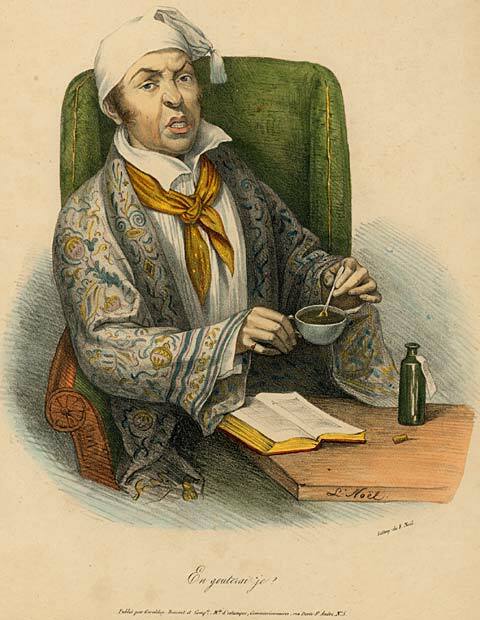 A seated man wearing a lounging robe and nightcap contemplates the unpleasant task before him. On his table rests a book, possibly one giving recipes for medical concoctions, and a labeled bottle with the cork removed. As he stirs the liquid in his cup, he peers out of the lithograph as if asking the viewer his question. His puckered-up face indicates that he already knows the answer.